Crazy Eyes is a character in the TV series “Orange is the New Black”. The TV series is based on a memoir by Piper Kerman and her experience in prison. Crazy Eyes is a mentally unstable inmate who develops an obsession with Piper Chapman. 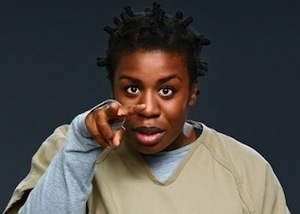 Suzanne AKA Crazy Eyes is a lesbian who has been a problem in the past, with a violent history. 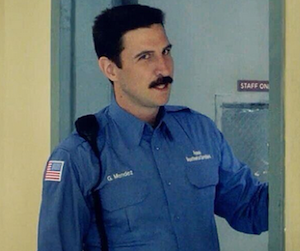 She refers to Piper as “Dandelion” and follows her around the prison. After Warren puts a request in with Healy to bunk together, Piper confronts her and rebuffs her advances. This causes Warren to retaliate by urinating on the floor of Piper’s cubicle while she is sleeping. As the season progresses, she starts to leave Piper alone and a more vulnerable side of Warren is revealed. 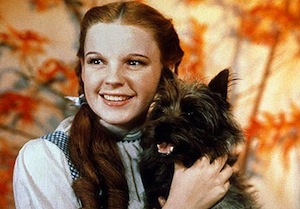 It is shown that she is hurt that everyone calls her “Crazy Eyes”. 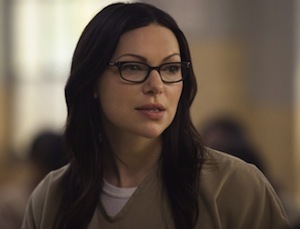 She also confesses to Piper that she came back from the Psyche ward, something few inmates do. She has a flair for reciting literature and poetry, often writing her own compositions. 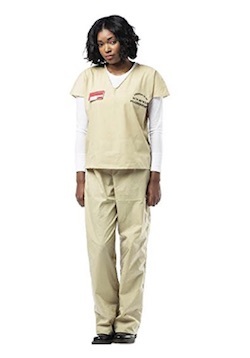 Here are some Halloween Crazy Eyes costume ideas for you to consider to become a prisoner. Prisoners wear orange jumpsuits in jail. You can wear these Crazy Eyes fashionable outfit as well. To become crazy eyes, you need her hair. Who can keep all that hair up and look so nice. They do have two different outfits in prison, the orange and beige. Take your pick. You can alternate through the day to pick whichever prisoner jumpsuit you want to wear today to look like Crazy Eyes.